It was an exciting qualifying session at Sepang, and a particularly good one for fans of Number 46 and Marquez the Merciless as well. Aiding matters for the riders was the fact that it rained at Sepang a few minutes before the session began. What that meant was that the track temperatures dropped a little, ensuring the front runners set their fastest times towards the end of the session. Qualifying on pole for was rookie Marc Marquez, who just pipped Valentino Rossi to pole position. 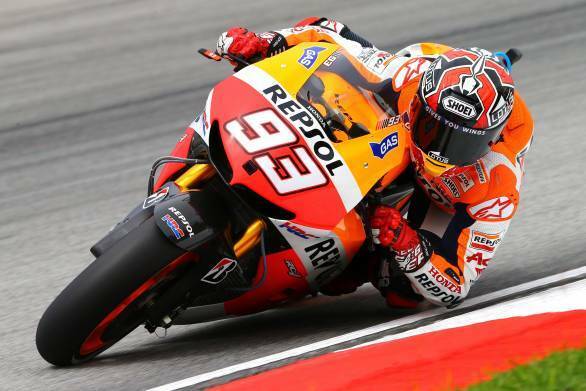 Marquez shattered the pole lap record at Sepang with a time of 2min 011secs. Rossi, who looked for a while like he would claim his first pole position of the season, managed a time that was 0.325 seconds off Marquez's record-breaking lap. The second-place qualifying position is the Doctor's best performance in qualifying all year. Third in qualifying went to Cal Crutchlow, despite an injured arm after the crash at Silverstone. Jorge Lorenzo's qualifying session wasn't particularly easy, with the Yamaha rider suffering a hairy moment near Turn 7. After pulling into the pits, Lorenzo started picking up his pace once back out on track. The Yamaha rider's times improved, taking him to the top of the timing sheets, albeit only temporarily. Lorenzo had to settle for fourth place on the grid. Fifth went to Dani Pedrosa, with Alvaro Bautista, Bradley Smith, Andrea Dovizioso, Aleix Espargaro and Andrea Iannone rounding off the top 10.